3. Don’t fall prey to the belief that you already know the law and your rights. These 3 assumptions will negatively affect you if you do have a case or need legal assistance. Let the legal experts help you decide if you do (or do not) have a case, how much the case may be worth and how long it will take to turn your situation around. I like this video’s recommendation not to wait to hire a lawyer. It makes sense that waiting when dealing with a legal situation would cause some serious problems. I’ll have to remember to have a lawyer to call in case of any sort of problem to ensure there aren’t any major mistakes made while trying to find one. Thank you for your comment. 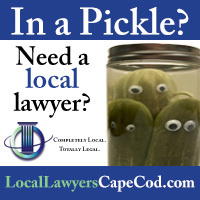 It is indeed one of the most common pitfalls that our local Cape Cod attorneys reveal. The sooner they can assist with a claim or case, the more opportunity they have to help their client(s). The two most frequently asked questions are ‘Do I need a lawyer’ and ‘Can I afford a lawyer?’ We hope all will assume the answer to both questions is ‘Yes’ and use the resources at Local Lawyers Referral to find information and/or the right lawyer to suit their purposes. Again, most attorneys offer Free Consultations to determine whether or not to proceed.